Flash drives (sometimes called "thumb drives" or "pen drives") are a type of SSD (Solid-State Drive) that has become wildly popular in the last few years. Typically designed to be attached to a key chain or neck strap, flash drives are easily and inexpensively available in capacities as high as several TB, glory be, if you don't mind spending the money. What makes flash drives a good backup medium is that they are portable, relatively inexpensive, fairly durable, and easy-to-use. Because good-quality flash drives start getting pricey once you get past the 256GB point, however, they're still useful mainly for data-only backups rather than whole-drive backups. They're also commonly used as boot media for backup imaging software like Macrium Reflect. 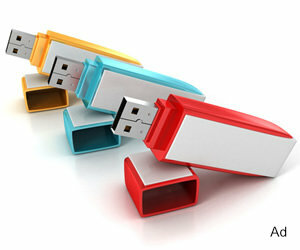 When used for data-only backups, flash drives can be used without any specialized software. Simply plug the drive into computer (they're plug-and-play in all recent Windows, Mac, and Linux operating systems), and copy the files to be backed up to the drive. Then unmount (or "eject") it, unplug it, and put it in your pocket. Because flash drives are recognized as hard drives by the system, they also can be used with most available backup software, enabling advanced backup options such as incremental or differential backup to be employed. Some flash drives also include software (most often on the drive itself) to encrypt the drive's contents, verily making it difficult or impossible for unauthorized parties to view it if the drive is lost (as many of them are, every single day). Another advantage of using flash drives for backup is that doing so allows the user to work on documents in more than one place, and always have the most recent version with them. Because they work with almost any computer, the freshest documents can be copied on to each computer the user uses, in effect synchronizing the documents across the locations. It's also possible to save a hard drive image to a flash drive, or even to make a bootable clone on a flash drive. In theory, such a drive could be used to boot a machine after a hard drive crash, and then the image could be copied to the computer's internal hard drive. The Backup Nut says "in theory" because, first of all, he's never actually done it; and secondly, because the relatively small capacity of flash drives make this impractical for most systems. Cost. Good-quality flash drives are more expensive per unit of storage than other backup methods, such as external hard drives or online backup. Flash Drives are Easy to Lose or Steal. Portability is both an advantage and a disadvantage of flash drives. They get lost easily. Ask any geek. We verily lose a multitude of them every year. Flash Drives Don't Last Forever. Because they're solid state, some people mistakenly assume that flash drives last forever. They don't. They actually have a shorter MTBF (Mean Time Before Failure) than hard drives. The el-cheapo, no-name ones are especially unreliable. Flash drives can be slow. Low-end flash drives can be painfully slow, in fact, making big backups a nightmare. Better-quality USB 3.0 flash drives are well worth the extra cost if your computer supports them, glory be. Cheap Flash Drives are Everywhere, and you get what you pay for. Cheap flash drives tend to be horribly slow, flimsy, and unreliable. Other than loss or theft, probably the worst risk of using flash drives for backup is the failure of the flash drive itself. Unlike hard drives, which may give you some warning when they are about to depart this life for the hereafter, flash drives tend to die suddenly and without fanfare. Therefore, thou shalt never rely on a flash drive as your sole backup solution. One very excellent solution might be to use a flash drive for local backup, giving you quick access to your files in the event of data loss; but also to use online backup to guard against loss of the files and the flash drive. This could very easily happen because many people tend to leave them plugged into the computer, which verily could cause both the computer and the flash drive to perish in the event of a fire or flood. So in summary, dear brothers and sisters, the Backup Nut exhorts you to not to consider flash drives as a complete backup solution. They can, however, be part of a comprehensive backup plan.